One of the difficulties of writing about experimental film and video is that there aren’t as many opportunities as there ought to be to spotlight filmmakers who we might call, for lack of a better term, developing talent. Magazines like this one (of which, sadly, there are few) customarily produce feature articles on unique new film artists in the midst of their growth and development, people with, say, three or four films under their belts. But early-career articles such as these are premised on the idea that regular film-festival circuiteers would have had some exposure to at least some of the films in question, and would be able to keep an eye out for the subject’s next work. This assumption can really only be made if we restrict our conversation to narrative filmmaking, even at its fringes. When my colleagues and I focus our attention on that portion of the film-festival beat devoted to international narrative cinema, there is nothing unusual about highlighting an exceptional filmmaker on the occasion of his or her very first film, some of whom may have made acclaimed courts-métrages beforehand. When it comes to the non-narrative avant-garde, we can assume very little. Only very established makers, with decade-spanning bodies of work, are likely to be showing somewhere almost all the time—think of uncontested masters like Ken Jacobs, James Benning, or Nathaniel Dorsky—yet they too continue to struggle for validation and screen time when compared with their narrative counterparts, the “usual suspects” at Cannes, Venice, and Toronto. Nevertheless, from a writer’s standpoint, it becomes tough to find the occasion to profile those film artists whose work has, in essence, bubbled under the larger spotlight of critical attention, despite consistent quality and dedicated application of their craft. In some cases, these filmmakers have displayed a trajectory of marked improvement, starting out with somewhat derivative work but recently coming into their own, strong voices. In other cases, they’ve simply gone from strength to strength. But I’ve chosen to profile these filmmakers because, in my opinion, their emergence over the last decade represents a noteworthy and exciting set of circumstances, and a moment of great promise, not only for the avant-garde but also for film culture as a whole. Naturally, understanding them requires a slightly shifted frame of reference, but not a separate set of eyes. There are two distinct streams in the work of German-Japanese filmmaker Sylvia Schedelbauer, and since her four films to date have essentially toggled back and forth between the two separate styles, it doesn’t make sense to discuss them in terms of “progression,” per se. This is not to say that there aren’t discernible trajectories at work within Schedelbauer’s career. Her first distributed film, 2004’s Erinnerungen (Memories), is a literal cleaning out of the familial closet, comprised entirely of still photographs and the filmmaker’s personal voiceover narration. The majority of the images, comprising nearly 2/3 of the 19-minute running time, are snapshots taken by Schedelbauer’s grandfather, a Nazi soldier about whom she was told virtually nothing throughout her childhood, aside from the fact that he’d died at Stalingrad before she was born. (She took these images from his “memory box,” which her family had kept from her for years.) Eventually the photos turn to those of the filmmaker’s own parents, documenting Schedelbauer’s father’s life in Japan, far from the Nazi past, and her Japanese mother, who defied her family by marrying a German. Again, image after image is accompanied by Schedelbauer’s attempt to fill in the blanks of a family history that has been all but concealed from her in its entirety. But of course, as Erinnerungen clearly demonstrates, Schedelbauer’s personal past continually intersects with the vicissitudes of world history. What makes these films so unique? Schedelbauer’s organization of her chosen footage, while not sui generis, is highly unusual and deeply evocative. Bruce Conner’s work has long been a primary touchstone for artists working in this vein, but Schedelbauer is one of the only filmmakers influenced almost exclusively by Conner’s gently paced, highly uncharacteristic diptych, Take the 5:10 to Dreamland (1977) and Valse Triste (1978). Like those films, False Friends and way fare rely on a hypnotic, subconsciously suggestive combination of images, ones that can evoke semi-tangible meanings upon close, repeat inspection (e.g., Freudian “dream-work”), but in the actual viewing are slippery and terse, drawing only traces of their denotative meaning from the mind before their disappearance. A great deal of this has to do with Schedelbauer’s editing patterns. Sometimes, as in False Friends, a single motif predominates (in this case, two men in suits approaching a suburban clinic), and other images flicker against that baseline. In way fare, there is a general motif—logging work in a forest—but no single set of repeated images. What Schedelbauer does is to create split-second fades between distinct images, based on shape and movement. We see men exiting a room, a maternity ward, soldiers at night, sexual images, and other formal material. The walking men also appear and disappear from shot to shot. The rapidity with which Schedelbauer manoeuvres this black-and-white source material turns it into some collective nightmare, gently applied. As I said above, her rhythmic schemes and graphic organization are not without precedent. Portions of False Friends, in particular, recalls the single-frame work of Gregory Markopoulos, and both films share Robert Beavers’ architectonic materialism. But this approach is almost never applied to found footage, and the result is an unsettlingly concrete confrontation with our own private image bank. Schedelbauer’s films create a mood of both seduction and anxiety; they generate a space we are certain we have occupied at one time or another, and are certain exists only in the dark recesses of the mind. When it comes to experimental film, you’ve got to keep good records. Very often, one exceptional film will leap out at you in the midst of a decidedly tepid group show, and it’s important to remember that maker as a “subject for future research,” because there’s no telling how long it will be before the two of you will cross paths again. This is precisely what happened with Florida-based experimentalist Christopher Harris, whose work I first discovered in 2004 while reviewing non-narrative shorts for the Nashville Film Festival. The only bright spots in a rather dismal lot were Mirror Mechanics by the ever-reliable Siegfried Fruhauf and Harris’ Reckless Eyeballing, a fairly direct provocation that also functions as a loving treatment of all-too-rarely engaged found-footage material. Eyeballing’s dominant motif is the image of Pam Grier from her Blaxploitation apex, with an unusual exchange of gazes—hers out at us, and the men in surrounding footage back at her. Harris is quite explicitly exploring the racial dimensions that Laura Mulvey left implicit (to put it kindly) within the Male Gaze question, sending Foxy Brown into the cinematic apparatus as a kind of test case. Can she look back, or will she too be pinned and mounted by the gaze? Or, is there a place for an African-American female spectatorship, an active subject position inside visual culture? 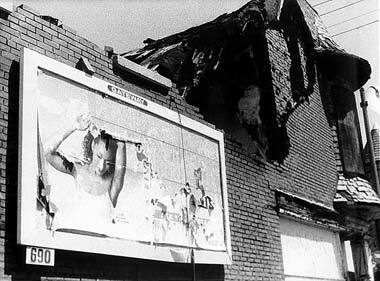 Within the film, Harris juxtaposes images of Angela Davis (including wanted posters) with the Grier footage, generating a fantasy/reality dialectic, and articulating precisely how cinema’s cultural image bank conflates African-American women’s desirability with danger. The film’s title, “reckless eyeballing,” is of course pre-Civil Rights Era cracker-talk for when black men allegedly looked lustfully at white women. (It’s a well-known expression: Ishmael Reed published a 1986 novel by the same name.) So the stakes are clear: looks and gazes, when to scope out and when to stare deferentially at the ground, are matters of grave historical importance for African-Americans, and all truly rigorous formal considerations should return us to historical thinking sooner or later. In this regard, it has been a distinct pleasure, and an education, to discover Harris’ other work. Like Schedelbauer, Harris began his filmography with his longest work to date, and one that is indeed significantly different than his other completed works. Having now seen his hour-long 2001 featurette still/here, it is somewhat galling that the film is not better known. If it did find a wider audience, I could see it very easily being recovered as one of the significant avant-garde works of the past decade. Comprised of a series of grainy, at times even dirty, 16mm long takes of inner city St. Louis, still/here surveys collapsed buildings, boarded-up businesses, and unconscionable civic neglect with a dispassionate camera, delivering slow tracking shots and extended fixed-frame views of desolation. The work displays affinities with James Benning and Straub/Huillet, as well as Ohio filmmaker Kevin Jerome Everson and British anarcho-archaeologist Ben Rivers. But the film differs in many key respects. People are seldom seen. Instead, we hear of their ghost-presence in Harris’ meticulous soundtrack of ringing telephones, doorbells, and occasional voiceover. This includes an introduction in which an unseen documentary photographer reminds us that every brick of every building represents the hand of an unseen labourer. still/here is similarly subtle in bearing the mark of its maker, but seeming uninflected somehow, an inevitable part of its landscape. By contrast, Harris’ recent work has displayed a much more deliberate formal flair, a desire to grapple with the tactility of the celluloid image. His two most recent works are part of a series collectively called 28.IV.81, and although the pieces are rather different, both display a concern with textures of light as well as the capacity of the human imagination to will celestial entities out of the relatively impoverished materials at hand. (Call them The Potted Plant of Life.) 28.IV.81 (Bedouin Spark) (2009) is a lovely miniature edited in-camera, in which Harris manipulates light around a child’s mobile so that a hanging nightlight with plastic silver stars becomes a glinting ersatz sky. His most recent work, 28.IV.81 (Descending Figures) (2011) is Harris’ first double-screen projection and, depending on how warped your sense of humour is, his first comedy. It’s also probably Harris’ richest film to date in terms of competing layers of representation and perception. I am a dedicated formalist, and sometimes this is the same thing as being an idiot. I’m actually using this word in a somewhat technical sense, meaning I tend to prefer to encounter films and their makers with as little foreknowledge and prejudice as I can, and even after I spend some concentrated time with the works in question, I very often remain in a state of (relative) idiocy. This isn’t even by design; it’s more automatic, a matter of temperament, and it’s gotten me into trouble on occasion. A writer or critic less prone to sustained idiocy would, for instance, perform research on a given film or filmmaker, in order to answer some very basic questions. How many other films has he or she made? How was the film I’m looking at shot and edited? Are the forms I’m seeing generated digitally or through some analog photographic process? And so on. Between a few Google searches and some quick emails back and forth with the filmmaker, most of these questions could be solved. However, I almost always refrain from this. Somehow, even if my own perceptions and intuitions are wrong, I find myself wanting to remain within them as long as possible. Of course, when I discover I’ve made a mistake, I correct myself. I mean, I’m not a neo-con. But as far as I was aware, Shambhavi Kaul was a budding experimental filmmaker currently on the faculty of Duke University. This is true, up to a point. But I didn’t know that she had previously made a feature-length documentary about outlaw country artist David Allen Coe (Field of Stone, 2007) or a documentation video about Kelly Heaton, an artist who made various objects out of Tickle Me Elmos (Live Pelt, 2003). And I most certainly didn’t know that she comes from a filmmaking family. (Her father is the great Hindi “parallel cinema” director Mani Kaul.) All of this certainly deepens my interest and appreciation for Kaul’s work. Context is always helpful. But as far as I’m concerned, Kaul’s relevant work consists of her two avant-garde films, Scene 32 (2009) and Place for Landing (2010). Scene 32 finds Kaul making a “return” of sorts to a birthplace of which she has very little direct recollection: the salt flats of Central Kutch in western India, where flood patterns alternate with extreme dry heat to generate a nearly alien landscape of grooved, granulated earth. The film manages to be both enigmatic and precise; we could call it the “geological uncanny.” Kaul provides us with wide, expansive views of a particular area of the fields, which she then follows with a much closer look at the same space (either an extreme close-up of the cracked ground, or in some later cases, a deeper portion of the receding landscape). Kaul’s editing gives us the A shot for a brief period, then interrupted by the B shot for a flash, then again for a longer flash, and then again until the B image replaces the A shot. This shifting back and forth between the macro- and micro-visual levels produces an extremely interesting effect with respect to spatial orientation, and the representation of filmic time. These manoeuvres disrupt the initial image’s sense of the ground’s solidity, breaking it, and its image, into component parts, particles accommodating substantial amounts of negative space. Compositionally, this also allows for a play of lights and darks. But eventually, her close-ups of snow-like salt banks alternate on the basis of shape rather than size. In both instances, Kaul is altering our sense of temporality within the landscape film. These spaces do not “roll out” before us like panoramas. Rather, they are zones of relative compression and dispersion. Kaul’s “movement” between shots implies a simultaneity, a vertical time wherein both views are, at any given moment, equally available. If the close-ups perhaps seem more “scientific,” or the long shots more “aesthetic” (my own supposition, nothing directly implied in Kaul’s film), then Scene 32’s organization makes it absolutely clear that these are merely attitudes with which to address the same, basically inert saltscape. And this shifting approach, or more properly this sense of material multiplicity, is echoed in Scene 32’s combination of crisp HD photography with gritty, pockmarked celluloid. While Kaul’s subsequent film, Place for Landing, is not as scrupulous in exaggerating the physical differences between film and digital imagery (it was shot in 16mm and completed in HD), in some respects it is even more complex. This is something that can be missed on first pass since its partial engagement with the domestic scene (it “stars” a young child, the filmmaker’s son Kavi) initially cues us for something simpler and more intimate, as though those two elements just obviously go hand in hand. Landing starts with a creaking sound and the movement of a bedroom door with a mirror on the back. This mirror movement allows Kaul to fill the shot with the kid as he stomps his feet in his room (seen from his bare bottom down). The internal tracking shot of sorts “mirrors” the motif Lucrecia Martel employed throughout The Holy Girl (2004), wherein direct and reflected lines of vision constantly changed places, keeping the viewer off-balance as to the status of his or her optical knowledge. At the end of the shot, the boy sits down, “landing” safely in the mottled mirror reflection. From here, Kaul begins to explore several qualities of pure colour and texture. We hear waves, and a modernist soundtrack of isolated, electronic “string” sounds, reminiscent of Webern’s quartets. Kaul, meanwhile, is providing rack focus within a mottled, peeling reflective surface, as a series of muted coloured lights plays across it in hazy sky-like transmission—wintry blues, sea greens. Next, Kaul shifts to black and white (and deep, resonant cello) for a similarly dimpled, vaguely lunar surface, partially produced through superimposition. Throughout Place for Landing’s dense six-minute running time, Kaul finds a bevy of pictorial modes with which to produce a mottled or agitated surface: viscous black liquid running down the frame; fragmented cloud-light patterned over blotchy topographic readings; gradual focus pulls through translucent curtains; rain over pen and ink. Over and against this we have the boy’s presence in the room, his skin, the amber light that surrounds him, and the drifting vertical mirror panels that bisect and redouble his inner space. By the end, the boy and his space have almost merged, his face represented in high-contrast black-and-white Kodalith style. Like Scene 32’s salt flats, Place for Landing provides a space that is less geographic than psychometric. The moon, the boy’s face, the gossamer flit of mesh curtains, and the mirror image combine to form an uneasy resting place for a continually unfolding consciousness. Tokyo-based Eriko Sonoda works at the juncture of video, photography, and installation, and her work is probably better known to Canadian audiences than some of the other filmmakers I’m profiling here. (She has screened once at Media City and twice in Wavelengths at TIFF.) In a way this makes perfect sense. In terms of the variety of her aesthetic venture, her fundamental concerns, and the frequent shape of her finished products, Sonoda evinces a certain intellectual kinship with Michael Snow. Not only does Sonoda’s work partake of the same dry wit, but she also enjoys turning perceptual exercises into parlour games, and vice versa. Sonoda’s videos are often silent, and when sound appears it is used sparingly at best; the soft purr of an institutional air conditioner or a gently clacking train is her idea of a soundtrack. (I guess you can go ahead and call it “Zen” if you have to.) But for those of us quite familiar with the whys and wherefores of formalist experimentalism, Sonoda’s understatement is a ruse, designed to lull us into a false sense of security. In reality, each of her videos is a bit of a perceptual shell game, situating its subject somewhere other than where we’ve been implicitly coaxed to look for it. 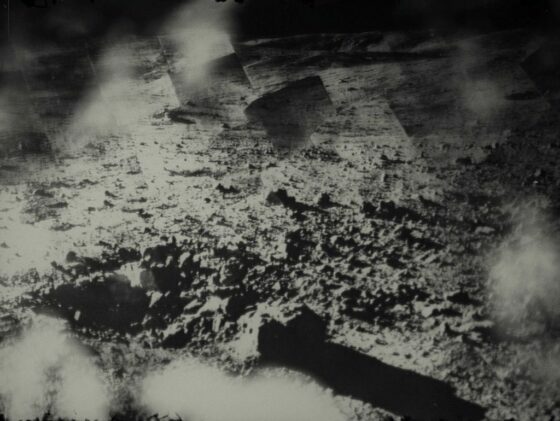 Following early work such as Mellow Drama (2004) and noon (2006), which adopted a fairly straightforward observational approach, Sonoda first developed her signature mixed-media mode with Garden/ing (2007), a six-minute black-and-white video that recalls both Snow and structural prankster Scott Stark, but announces Sonoda as having a sensibility all her own. Initially, Garden/ing appears both simple and guardedly domestic. We are given a view of a backyard landscape, complete with hanging laundry, through the wrap-around picture window of a suburban-style house. The camera arcs along the contour of the recessed window in a staccato motion, generating an almost animated set of picture-panels, the yard space described onscreen through a curvature all the more exaggerated by this staggered punctuation. Sonoda repeats this process several times, slightly shifting for light differences but mostly rearticulating the basic structure. Then, after a blackout, the strangeness begins. First, portions of the window are covered over by actual-size photographs of the precise view that the video camera’s distance produced through them in the previous shots (thereby repeating the earlier arcs, but adding an artificial, papered-over element reminiscent of the Conceptualists, particularly John Baldessari and Joseph Kosuth). In time, Sonoda produces multiply confounding levels of photographic mise en abyme, with the camera tracking “around” a flat panel of images of the motion around the recessed window, the depth effect contained in the still images and not in the video itself. Sonoda orchestrates these shifts so quickly that we really don’t know what we’re seeing until it’s half over. And yet, the progression (or degeneration) from layer to layer of spatial deception is utterly logical. You could foresee what would come next, if you only had the time. Garden/ing: the Derridean slash places the relationship between stable noun and fluctuating verb in suspended chaos. It remains Sonoda’s finest work, but her recent videos have continued this exploration of the formal relationships between motion and stillness, and what happens when the digital image is broken down into its constitutive parts and then reassembled under different conditions. In this respect, Sonoda picks up on the original questions of motion study that preoccupied the first generation of so-called structural filmmakers (Snow, Jacobs, Frampton, Gehr), resituating them in the digital era. 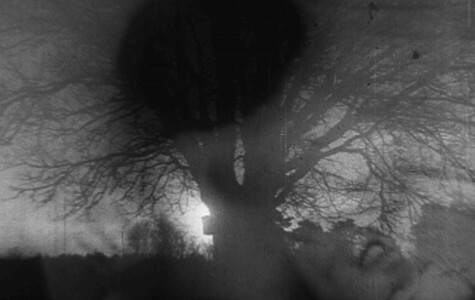 Landscape, semi-surround (2009) takes as its subject one of the classic tropes of early cinema—the train voyage—and breaks it apart into a mobile grid. The first part of the video consists of slightly slowed-down, halting footage out the compartment window. (As with Garden/ing, we see Sonoda’s silhouette here and there, operating the camera.) Then we retire to the clean white space of the art gallery, where a wall shot is composed in a kind of super-shallow diorama, just the wall with a bit of jutting parquet flooring at the bottom of the screen. At this point, the wall is covered by large photographs in a 4×4 grid. These are images from the train video, and Sonoda is animating them in sequence, essentially “replaying” the short video passage across the wall, in sequence, on the 12 paper “monitors.” She plays with speed, rhythm, and eventually introduces photo-only effects such as a thin, distorting gesso wash. The grid-disphasure video recalls certain similar experimental film and video work (by Peter Rose and Gregg Biermann in particular) with the proviso that Sonoda’s work (again, like Snow’s) is not multimedia but mixed media, bringing photography, digital video, and even drawing into the purview of a single piece. In fact, her latest work, Space is the Place, uses video to add a specific time dimension to what is essentially a work of minimalist installation. Once again shooting a gallery space, this time at the corner, Sonoda covers most of the white walls with moving pieces of white paper, travelling across the space in a left-to-right grid pattern. 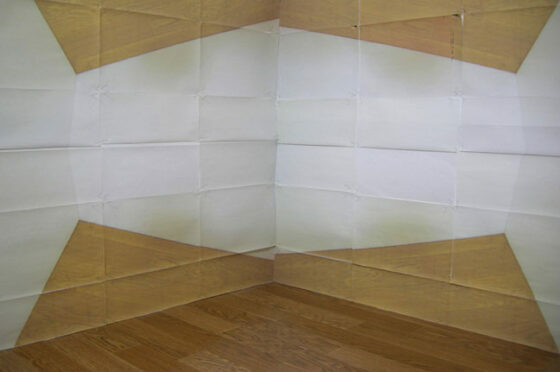 Interrupting this expanse, mostly along the bottom but occasionally peeking out from the top, are images of beige hardwood gallery flooring (with a slightly lighter finish than the gallery floor itself), forming triangles that bob up and down from the base of the wall like toy sailboats in a bathtub. In time, these triangles rotate, invert, and even break apart into kaleidoscopic geometrical static. Sonoda’s work is still resolutely “in” video, but is more directly connected to artwork that engages with the gallery/museum space as its own subject (the Asher/Lewitt/Smithson line). And, just to prove that nobody’s got her number, Sonoda has also recently produced Kodomo (a child) (2010), a piece of straight-up, image-driven video art in the Bill Viola mode, a tape that explores forest spaces, natural light, and concludes with a three-minute shot of a spider struggling and failing to consume a butterfly caught in its web. Most artists, still stuck in the Romantic mode, would undoubtedly identify with the butterfly, but I tend to think Sonoda is the diligent weaver, installing delicate eye-traps in a nondescript corner and waiting to see what happens next.